The Speed Hurdle Pro’s low-profile design and one-click height adjustment means less tripping and more pushing to new levels of performance. The hurdles coaches and athletes have asked for are here. 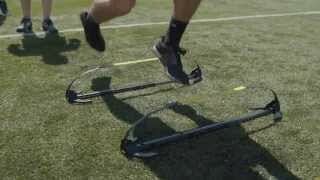 The Speed Hurdle Pro is the most versatile hurdle available, offering variety to training sessions with adjustable 6-, 9- and 12-inch height settings. Each hurdle features a highly durable base, low-profile design for feet of all sizes and innovative, bounce-back construction. You put a lot of work into your training sessions and practices. Now there’s a hurdle with the thought to match. The Speed Hurdle Pro adjusts to 6-, 9- and 12-inch settings so you can control the focus of your training. There’s not a cleat size these speed, agility and plyometric hurdles can’t handle. The Speed Hurdle Pro transitions in a click between three heights—6”, 9” and 12” —to give you control and versatility in drills and workouts.